'Y'all Won': Cardi B Says She and Offset Aren't Together Anymore. He Seems Salty. The tumultuous rollercoaster known as Cardi B & Offset (did they have a cutesy couple’s name? Coffset?) has come to a screeching halt. The two had been awash in cheating rumors, with the Migos member constantly being accused of stepping out on his wife while she was pregnant. 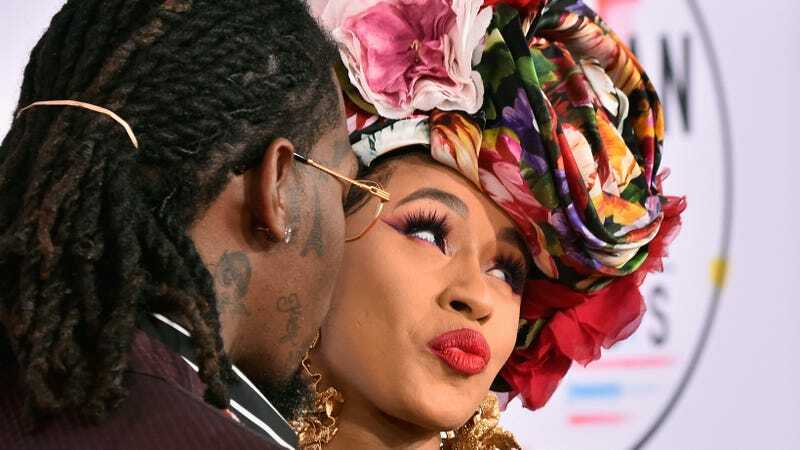 The rappers-in-romance secretly wed in September 2017 and Cardi subsequently gave birth to their daughter, Kulture Kiari Cephus, in July 2018. The two had been dodging said rumors with dramatic denials (basically “y’all all up in our Kool-Aid and don’t even know the flavor”-type rebuttals) and lovey-dovey social media pictures—until now. In her very Cardi-esque way, the Invasion of Privacy rapper decided to put a stop to all speculation by simply taking to Instagram to make it abundantly clear since everyone was so thirsty: She and Offset are not together anymore. She captioned the Instagram post with, “There you go... peace and love.” That’s it; that’s all. While she didn’t explicitly reference cheating being the cause of the split (she only said it was “nobody’s fault”), the constant rumors did seem to get to the 26-year-old star, at one point. “Every single day there’s rumors about me and my dude. And it almost drives me crazy, because I start to believe them. I don’t have no proof. I don’t have receipts. But I just got to know my man,” Cardi told W Magazine in her cover story back in October. As for Offset, he apparently commented under the video with, “Y’all won,” according to TMZ. Who is “y’all? !” Let me find out there were Olympic trials to force Cardi B and Offset to break up! Because Twitter gon’ Twitter and niggas gon’ nig, the jokes quickly followed. Others posited the two were crafting some sort of publicity stunt. For one, Cardi is a Love & Hip Hop alum and celebrities are known for that sort of thing, in general. Anything is possible. At least they’re still “really good friends and really good business partners” for the time being. Stay tuned.